Barkers Marquees is a privately owned company run back husband and wife team, Paul Barker and Lucy Gibbs. 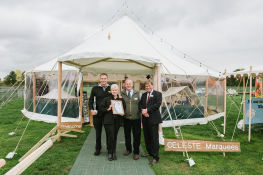 Here we are receiving a prize at the Showman’s Show for our Marquees. Barkers Marquees started life in 1884 as a small catering company, early records show us erecting tents at Epsom Races and Hampton Court. Charles Fredrick Barker erected beer and tea tents to house the catering company’s beer and light refreshments at Epsom Races, under the ‘three brooms’ marker. Soon the Marquees Hire business took over from catering. By the 1950s, C F Barker and Sons were one of London and the South East’s leading Marquee Hire Businesses with the largest Marquee in Europe. 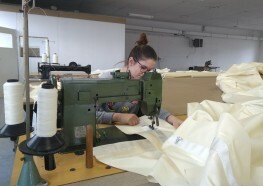 In 1921 we started manufacturing marquees for ourselves and other companies, in 2002 we decided to split the Hire and Manufacturing businesses. Paul Barker (Grandson of Charles) heads Barkers Marquees manufacturing company today.